Editor's note: With the sale of The Vallejo Inn to Cal Maritime one of Vallejo's problem motels is on the way to becoming something positive. But how bad actually is the Vallejo Inn? Read on to find out....what Reeeeeeeealy Bad looks like statistically. To investigate the number of Calls for Service received by the Vallejo Police Department for eight (8) Motels located in South Vallejo. Over the past several years there have been anecdotal reports of high police activity associated with some of the Motels located in South Vallejo. Citizens believe that some of the Motels are attracting a negative element. They also believe that the Motels require a great deal of service from the Vallejo Police Department at a time when the number of Police available to serve the rest of Vallejo is inadequate. Just as with large subsidized apartment complexes, these concerned citizens feel that more attention need to be focused on these Motels. A Public Records Act request was made to the Vallejo Police Department for Calls to Service for the eight Motels located in South Vallejo west of I-80 for the time period January 1, 2011 through December 18 2013. Below is the list of hotels with the number of units (reported in website). As the number of units/rooms offered by the Motels varied significantly a CALLS PER UNIT measure was created so that the Motels could be compared. For this example the Motel averaged 2 Calls for Service per unit (room) for the year. Caution should be used when trying to compare Motels using Calls for Service. The reasons for a Call for Service can vary from something very minor such as a vehicle being illegally parked to a domestic disturbance, shooting, robbery or murder. In some cases the Call for Service is a duplicate call (from another person) or unfounded. Despite the above cautions, Calls for Service is a useful measure. A Call for Service can be used to estimate how much a Motel is costing the City. A Call for Service is estimated to cost the City about $500. Second, when Calls for Service are significantly higher than surrounding residences/motels etc. it is often an Indication of a poorly managed facility that is a public nuisance. There is a great deal of variability in the in the average number of Calls per Unit among the 8 Motels in the analysis. (see Table 1). The Vallejo Inn had the highest Calls for Service per Unit in 2013 at 2.35 (calls per unit) while the Budget Inn had the lowest at .12. 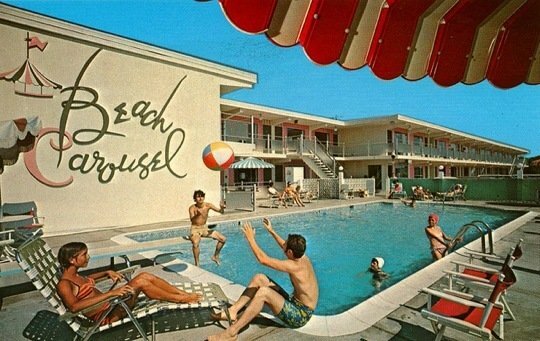 The larger Motels had more Calls per Unit than the smaller Motels. Over the past 3 years 6 of the 8 motels had an increase in the number of Calls per Unit (see Table 1). Calls per Unit more than doubled during the past 3 years at the three (3) largest Motels (Vallejo Inn, Motel 6 Maritime and Motel 7). The smaller Motels had significantly smaller increases in the Calls per Unit . Over the past three (3) years the Vallejo Inn has had 24% to 87% more Calls per Unit per year than any of the other Motels in this analysis. As with earlier articles about large apartment complexes, several of the Motels in South Vallejo require high levels of service from the Vallejo Police Department. 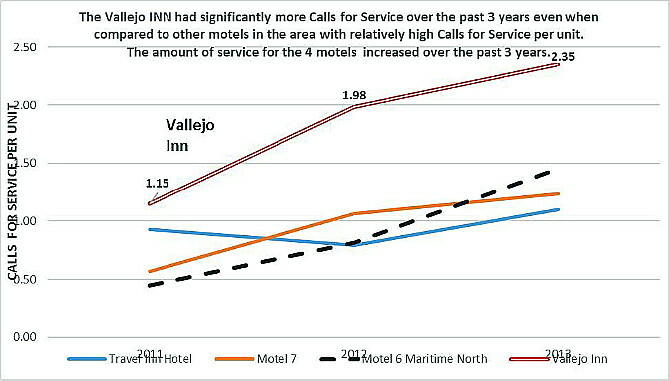 For 2013 the Vallejo Inn had 87% more Calls for service per unit/room compared to the other nearby Motels in this analysis. The average Calls per Unit is similar to apartment complexes that are considered public nuisances. If police calls to the Vallejo Inn were reduced by 50% it is estimated that a savings of $60,000 would occur. What is particularly troubling is Calls per Unit has more than doubled for not only the Vallejo Inn but also for the Motel 6 Maritime North and the Motel 7. Potential reasons for this increase includes, more long term stays (over 30 days), lack of motel staff to monitor individuals and a willingness to ignore criminal activity. Hopefully some of our Readers can provide some insights about what is creating the high number of calls for service at these Motels. While the City of Vallejo has sent letters to the owners of the 40 motels in Vallejo more action is required. Calls per Unit (over the past 3 years) should be calculated for all of the Motels in Vallejo and presented to City Council once a year. As with larger apartment complexes, a quarterly meeting of the owners/managers of all of the Vallejo Motels should be held by the City to discuss methods for reducing Calls for Service and improving security. For Motels with above average Calls per Unit the VPD should meet with the Motel’s management to discuss specific steps that could be taken. Follow-up visits twice a year should occur until the Calls per Unit declines significantly. I personally would like to thank Chief Kreins and his Staff for their response to my Public Records Act request. Within 24 hours I had the data I requested in exactly the format I required.